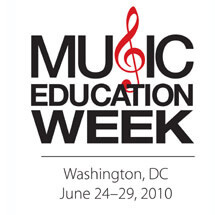 MENC's inaugural Music Education Week in 2009. Education has long been a focus for Drum Corps International groups and staff members (Nearly 60 percent of college-age corps members study music!). Thanks to DCI's growing partnership with MENC—the National Association for Music Education— the drum corps community now has an opportunity to help teachers improve and promote marching music education at schools around the country. 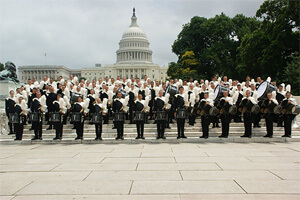 In 2009, the two organizations assembled the Marching Music Blue Ribbon Panel of educators and professional musicians to help develop new National Standards for Marching Music Education. "The standards will be included as part of the National Standards for Music Education and will assist music educators and leaders in developing quality marching music education programs in their schools," says MENC Deputy Executive Director Earl Hurrey. The standards will cover three areas: musicianship; movement and aesthetics; and health and safety. They will be presented as part of a two-day event on June 25-26, coinciding with MENC's annual Music Education Week in Washington, D.C. (MEWW). The inaugural Marching Music Academy, presided over by DCI's Judge Administrator John Phillips, will include nine workshops, starting with the Blue Ribbon Panel's explanation of the Standards. "The purpose of the workshop is to support music education, to improve the understanding of the skills involved in teaching marching music," Phillips says. "We bring the experience and credibility that DCI has in the United States and internationally." Friday's classroom discussions will include such topics as marching design, music arranging, and guidelines for keeping marching musicians fit and healthy. "A big part of the workshops will be training in health and safety," says Phillips. On June 26, attendees will be presented with a live instructional session by the 2008 World Champion Phantom Regiment, which will focus on how to make better use of rehearsal sessions, both in small group and full corps settings. After a discussion on the educational uses of competition, teachers will have the opportunity to attend the DCI Salutes America Premier Event, featuring the Bluecoats, Boston Crusaders, Crossmen, Jersey Surf, Phantom Regiment, and Spirit. There, Marching Music Academy participants will get to assess the corps' on-the-field performances and compare their evaluations with the event's official scorekeepers. "We'll provide them with judges' sheets and afterward talk about how they scored in comparison with how the professional judges did," says Phillips. "I'm really excited about that." "MENC is nationally recognized as the most authoritative voice for music education," Hurrey adds. "And likewise, DCI is nationally recognized as the premier marching music organization. Together, we present a powerful alliance in support of quality music education programs for all." Introducing MENC's Marching Music Standards With John Phillips, Ontario, Canada and members of the Blue Ribbon Panel. Align your entire music program with the National Standards. MENC and DCI introduce the Marching Music Standards, developed by representatives from a cross section of the pageantry arts. Musical Arranger's Forum With J.D. Shaw, University of Miami, FL; Paul Rennick, University of North Texas, Denton; and Richard Saucedo, Carmel High School, IN. Learn the secrets of successful arranging for marching music ensembles. Get tips for your creative journey from planning to arriving at the end result. Presented by Jupiter Band Instruments. Using the DCI score sheets, rank and rate the performances of the performing corps, then compare your findings to the judging panel results. Discover ways to engage your students in an effective rehearsal every time. Learn how to design pedagogical approaches to help students achieve their potential. Registration to the Marching Music Academy includes tickets for transportation and admission to this event, which features six of the world's most elite drum corps ensembles. Music educators interested in taking part in the Marching Music Academy can register through MENC by May 28 to receive a discounted rate. View the complete Marching Music Academy Schedule (PDF). Download the registration form (PDF). Learn more about MENC's Music Education Week. Learn more about the DCI Salutes America event. Photo courtesy MENC.